This month, we asked school librarians to identify a specific piece of research or a research study that informs their work. As you would expect of librarians, and just one more reason why collectively they are so awesome, many participants of this One-Question Survey provided more than one piece of research that has impacted the work they do with teachers and students. As the chart illustrates, the research was fairly evenly distributed across six categories with research on reading and reading motivation accounting for slightly more than one in five responses. Specific researchers and reading enthusiasts frequently mentioned within this research category were librarian supporter extraordinaire, Stephen Krashen, reading advocates Kelly Gallagher and Donalyn Miller, and summer reading champion, Richard Allington. With declining administrative support for school libraries in recent years (ALA 2017), it is now more important than ever for school librarians to demonstrate that the work that they do really does make a difference for the schools they serve. 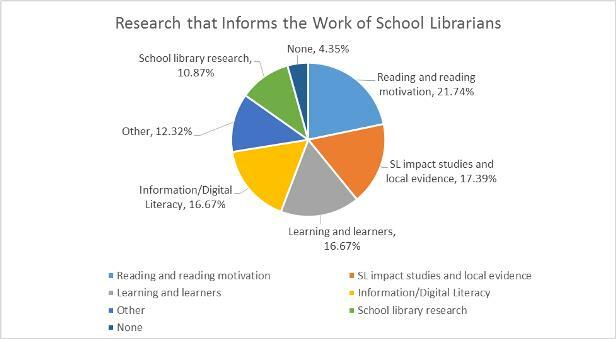 Consequently, many librarians include the school library impact studies (Scholastic 2016) in their advocacy tool belts. Of greater importance for advocacy purposes, however, is the evidence that school librarians collect and share that points to the ways that their OWN practices impact their schools—kudos to the participants in this survey who identified their own research, conducted in the name of evidence-based librarianship, as the most informative research! Naturally, school librarians strive to improve their own practice and their impact on students, and for this purpose, they call upon other school library studies that are most commonly published in research journals dedicated to school librarianship such as School Library Research and School Libraries Worldwide. From past surveys (Dickinson 2014) it is clear that school librarians chose this profession because they care about the children and adolescents with whom they work; thus, it is not at all surprising that school librarians rely on research that informs them about the students they serve. School librarians pointed to the importance of research on learners and learning, including brain studies that shed light on child development and research focused on cooperative and project based learning, gaming, reflective practice, general learning motivation, and dispositions conducive for growth and learning. Additionally, librarians identified research focused on English language learners and children living in impoverished conditions as useful for them as they work to meet the needs of specific learners within their communities. With information behavior, information literacy, and inquiry being primary domains of expertise for librarians, it is only natural that school librarians would turn to the research in this realm to help them maximize their roles as information specialists. Specifically, respondents to our survey pointed to the work of Carol Kuhlthau as helping them understand how and why to engage in inquiry with learners. Additionally, many survey participants pointed to the Stanford History Education Group's work as beneficial for their practice. Finally, for the One-Question Survey (1QS) each month, respondents provide "other" replies that do not fall neatly into any category, and such was the case again this month. In truth, this is one of the delights of working with the 1QS data and with librarians—there's always an unexpected surprise! American Library Association. "School Libraries." In The State of America's Libraries 2017: A Report from the American Library Association, edited by Kathy Rosa, 2017.http://www.ala.org/news/state-americas-libraries-report-2017. Dickinson, Gail. K. "What One Thing Excites You the Most about Working in School Libraries?" Library Media Connection 33, no. 3 (November 2014). https://schoollibraryconnection.com/Home/Survey/1945893?topicCenterId=1945913. Stanford History Education Group (SHEG) "Evaluating Information: The Cornerstone of Civic Online Reasoning." SHEG, 2016. https://purl.stanford.edu/fv751yt5934. MLA Citation Cahill, Maria. "Research that Informs the Work of School Librarians." School Library Connection, April 2018, schoollibraryconnection.com/Home/Survey/2143896.